Easily backup iPhone SMS and iMessages to computer. Transfer your iPhone SMS and iMessages to computer in TXT and HTML file rapidly. Preview iPhone SMS and iMessages on your PC. Support all iOS versions like iOS 12. Work well with all iPhone and iPad including the latest latest iPhone XS, iPhone XS Max, iPhone XR, iPad mini 4, iPad Pro. Worry about losing those important SMS in your iPhone? Let ImTOO iPhone SMS Backup help you. ImTOO iPhone SMS Backup is smart and high-quality iPhone backup software which can help you take care of your SMS and iMessages in iPhone. It can easily transfer iPhone SMS and iMessages to your computer and keep them safe. With this easy to use tool, you can view and save all the iPhone SMS and iMessages on your computer easily without endless scrolling down on iPhone. ImTOO iPhone SMS Backup not only backs up iPhone SMS and iMessages to computer, it also allows you to export them to computer as .txt or .html file, so you can easily read SMS and iMessages in the same model with iPhone. And if you back up your SMS and iMessages with ImTOO iPhone SMS Backup regularly, they will be never lost. 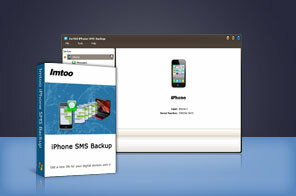 Download ImTOO iPhone SMS Backup free now and enjoy it on your PC. View all the SMS and iMessages including received messages and sent messages in list form with info like Name, Number, Type, Date and Message displayed automatically. Back up iPhone SMS and iMessages easily by exporting them to .txt or .html file. With .txt file, you can read SMS and iMessages on your computer or phone. With .html file, you can read them in the same model like read them on your iPhone. Input any word from Name, Number or Message to look for the SMS and iMessages you need swiftly. As long as the iPhone is connected, info about your device will be showed in the main windows of the software automatically, such as version number, iPhone name and serial number. Support all the iOS version like iOS 7. Support full series of iPhone and iPad, e.g. iPhone 5s, iPhone 5c, iPhone 5, iPhone 4S, iPhone 4, CDMA iPhone 4, iPhone 3GS, iPhone 3G, iPad Wi-Fi, iPad Wi-Fi+3G, iPad 16GB, iPad 32GB, iPad 64GB, iPad2, New iPad, iPad Air and iPad mini. Display your iPhone information like version and serial number automatically. Enter any words from message content to look for special message(s). Freely change skin to the style you prefer. Distance between Name, Number, Type, Date and Message is adjustable for you to read more details under the special column easily. The interface is available in English, German, Japanese, French, Italian, Spanish, Simplified and Traditional Chinese. iPhone to PC transfer software to transfer iPhone music, video and photo between iPhone, computer and iTunes.